Walmart (WMT) found itself on the defending end of a massive employee class action suit in California when a California judge certified a class of 10,000 employees who though Walmart broke the law when it refused to provide suitable seating for its cashiers who requested it. The frequency with which class action employee lawsuits are filed against Walmart gives rise to questions about whether Walmart employees are exceedingly disengaged and litigious, or whether Walmart's overarching relationship with its employees is exceedingly contentious. Either way, Walmart class action employee lawsuits seem to happen often enough to be considered "business as usual." Another day, another Walmart class action employee lawsuit. But what is not so commonplace or common knowledge is how much U.S. retail employment law is defined by Walmart's ethics and how successfully it defends its ethics in courtrooms around the world. Walmart's response to this particular class action certification was not that it did, in fact, provide appropriate seating within parameters of existing laws. Instead, the response from Walmart's legal team was that the class shouldn't have been certified at all, and instead, each cashier should have to file and fight an individual lawsuit. Logically it seems that Walmart would prefer to just fight one lawsuit instead of fielding 10,000 individual claims. But probably legal actions work just like coupons for the world's largest retail chain. When you make the "deal" available to the masses, you're gambling that only a small percentage will actually take you up on the offer. Publicly, Walmart is not denying that it has consciously chosen to deny seating to its cashiers. Reportedly Walmart's argument against providing seating is that cashiers need to be able to move around to look inside carts, stock shelves, and greet customers. To follow that argument through to the end, Walmart believes that if its cashiers are given an opportunity to sit down at any time during their work shift, that the cashiers will then lose their ability to ever stand up again. As if the cashiers are going to say, "No, I won't go stock those shelves or greet those customers because since I have a stool, my job is to now sit on my stool for my entire shift." The point of contention seems to be a confusion between the Americans With Disabilities Act (ADA) and California state law. ADA legislation mandates that reasonable accommodation is made to employees with disabilities. With the increase in the number of employee lawsuits filed related to ADA legislation, the definition of a disability seems to be getting looser by the day and by the lawsuit. "1. All working employees shall be provided with suitable seats when the nature of the work reasonably permits the use of seats. 2. When employees are not engaged in the active duties of their employment and the nature of the work requires standing, an adequate number of suitable seats shall be placed in reasonable proximity to the work area and employees shall be permitted to use such seats when it does not interfere with the performance of their duties." So, disability or not, California says retail employees should be provided the opportunity to sit down at any time that it doesn't interfere with their work. Walmart is taking the position that it shouldn't have to comply with the California Industrial Welfare Commission's rules. Why? Because Walmart says so. The appropriate name for the legal battle should be The State With the Biggest Population in the U.S. vs. The Corporation With the Biggest Revenue in the U.S. Speaking of annual revenue, California's annual revenue of $97 billion is less than the $113 billion that Walmart collects at its cash registers every quarter. So the state of California is the legal David to the goliath Walmart. Why Not Just Provide Chairs and Avoid the Lawsuit? To avoid this legal battle altogether, Walmart could probably have purchased 10,000 stools from one of its many suppliers for about $1 each. Instead, Walmart decided that its opinion about suitable seating took precedence over the opinion of California agencies and lawmakers. The threat of a $100 fine per employee per pay period since 2007 didn't scare Walmart. It's just another game of Legal Chicken that Wal-Mart is known for playing around the world. It will be interesting to see if Walmart is able to once again bully its way around the legal playground in California enough to wear the class action legal team down, avoid substantive penalties, or force the state of California to change its requirements regarding employee seating altogether. It's really a battle of People vs. Money, so it's probably pretty easy to predict the way things will go. 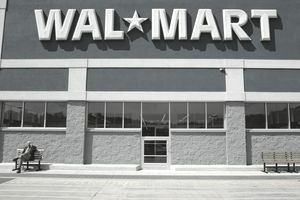 Simultaneously with the suitable seating lawsuit, the perpetually busy Walmart legal team was also defending itself against an individual employee lawsuit filed recently for malicious prosecution, as well as a suit filed by a group of warehouse workers claiming poor working conditions and safety violations. In the warehouse case, a judge ruled last week that even though Walmart does not directly employ the warehouse workers, the company could still be named as part of the lawsuit because it owns and/or leases the warehouse facilities where the bad working conditions allegedly exist. At the same time, Walmart was also on the legal offensive with employees, filing lawsuits against groups that are daring to protest against Walmart's working conditions and employment policies. A suit filed against the United Food and Commercial Workers International Union (UCFW) and a separate suit filed against OUR Walmart group organizers both sought injunctions to stop protest activities from happening in and around Walmart stores and at Walmart shareholders' meetings. Walmart leaders don't really address whether the issues fueling the protests are valid. They just want the courts to help them shut the protestors up. And then there are the tragic Bangladesh factories where employees burned to death while creating the garments that would stock Walmart shelves. The Bangladesh tragedy is not a legal battle as much as it is a moral debate. Walmart's initial response was that the Bangladesh factory employees weren't Walmart's employees, so what happened at the factory was neither Walmart's fault nor responsibility. So, the official ethical position from the world's largest retail chain is "What happens in Bangladesh stays in Bangladesh?" Walmart has never earned a spot on the Most Ethical Retail Companies list. Certainly, Walmart is not the only major U.S. retail chain that is being taken to court by its employees. It's just the one that seems to be taken to court by its employees the most often. Retailers large and small must pay attention to employee legal actions because each legal battle sets a precedent for every retail company in the world doing business in the U.S. Since Walmart is the defendant more often than most any other retail company, the Walmart legal team has the most influence in defining labor laws for the entire U.S. retail industry. In essence, with every lawsuit that Wal-Mart defends, the entire U.S. retail industry is being aligned to the ethics, human resources philosophy, and employment practices that Walmart is willing to fight for. Depending on what you believe to be true about how Walmart regards its employees (and the factory workers employed by its suppliers) this could be a terrifying thought for the future of retail employment in the U.S. There are two sides to every court case and certainly not every employee lawsuit filed against Walmart has merit. But the sheer number of employee lawsuits filed against Walmart gives cause to wonder if it wouldn't be more productive for the retailer to reallocate at least a portion of its legal budget to positive employment best practices.